In this post I am going to show you some of the top companies that are producing insect feed for mono-gastric farmed animals and some other interesting purposes. The road to insect based products are being paved by some very creative and innovative companies. Many of which are already selling products that are available to both consumers and industrial customers right now. A few weeks ago we covered some of the insect food products you can buy at supermarkets or online right now. 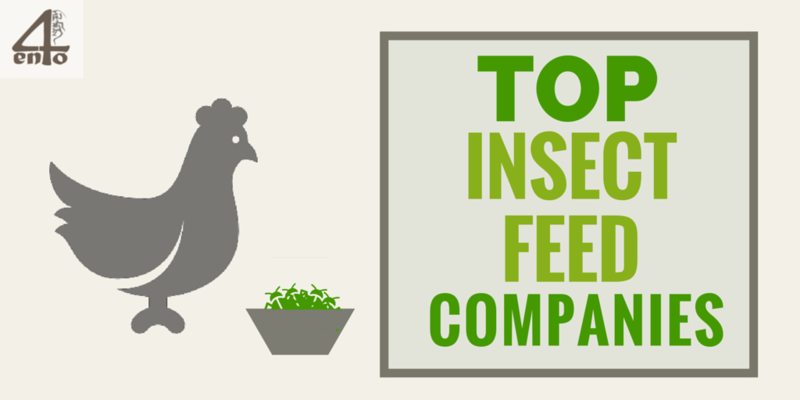 However this time I wanted to take a look at the other side of the coin – feed companies using insects. There are so many out there popping up all the time, so this list is not intended to be comprehensive. Let us know if there are companies you think should be on this list. These are instead the companies that have popped up on my radar over the last year or so. Companies that are mostly using similar broad technologies and techniques to create industrial scale insect based feed and other products. What Insects Are They Using, and Why? Unlike the large range of insects that we see being used in consumer food products, feed companies are mainly using the larvae of the Black Solider Fly. Why is the black soldier fly so popular, you might ask? So these very useful insects can produce masses of handy proteins and fats that can be repurposed by feed companies. And the side effects of the flies are minimal to none. On top of this, they are great at processing wastes (like foods) that we otherwise have to place somewhere to simply rot. Agriprotein in particular is also using a couple of other flies to process various kinds of waste. As well as the black soldier fly, they use both the common housefly (Musca domestica) and the blowfly (Calliphoridae family). These flies are great for processing abattoir waste, whereas the black soldier fly is far better at processing manure and vegetable matter. I will not go into specifics in this post but there are other insects that could be used to produce feed and the FAO has some further information on this if you are interested (see section 7.3). Bio-waste processing is a fantastic alternative for producing animal and fish feed. Normally such processes are resource intensive and and wasteful too. So the insect alternatives are something that is fast opening people’s eyes. And with the increasing demand for products like fish, this issue is becoming more important. Especially as the oceans are already becoming overfished. So instead of wasting our precious wild fish resources to make protein for farmed fish, it makes a lot more sense to use less resource intensive products like those from insect larvae, right? The other option has always been soy-based proteins, which consume 95% of the soy production right now. And although this is somewhat better than using fish to feed fish, it is still quite resource intensive. Especially when you compare it to insect larvae products which actually consume waste products instead of valuable farming resources. Now you know what these companies are doing, and how they are doing it (more or less, I will let them explain the details of their own processes), let’s take a look at some of the most outstanding ones around. The Enviroflight team are using the Black Soldier Fly larvae to process waste products (food, brewery waste etc) and turn them into useful food and plant nutrients. They are working on insect meal animal feed as well as plant fertilizers all as products of their Black Soldier Fly based systems. Agri Protein produces two products (a natural protein meal and oil) which can be used as a growth facilitator in agricultural feed preparations. Some of the by product of their larvae can also be used and sold as a soil. And they also sell the dried larvae directly as by the pet food industry. Ynsect are still in the development phase, but they are working with both flies and beetles using similar bio waste processing techniques to most of the companies on this page. They will then use the by-products of this process to develop a variety of products including animal and pet feed, plant nutrition and more. They also provide some of their knowledge and insect raising technology if you are interested in getting started yourself. You can find more details here. This waste food is then fed to insect larvae (from the black solider fly) that consume this material. The mature insects are then harvested and turned into nutritious protein and oils that can be used as a replacement for wild fish and soy alternatives, that are far more costly and resource intensive. They sell a range of products from animal food to oils for animal foods (that replace the standard omega oil sources). Another bonus of their harvesting process is a fertilizer that is nutritional rich and a great alternative to the standard chemicals that are used. BioFlyTech are a spin off of the University of Alicante in Spain. They have four separate divisions, focused on the use of flies (various species of dipterans) as alternatives to current feed, pollination and other technologies. Their feed division uses the flies as raw material for animal feed. The insects are processed to create flour, and also raw ingredients such as proteins and fatty acids. The idea is to use these various products in pet food and feeds for aquaculture, aviculture and animal production. Entomotech is not yet in production, but they are research a huge variety of insect applications. Anything from insect feed alternatives to medicine, they are looking into it. The insect based feed industry is just starting to take shape and things are changing at a rapid pace. There are many more companies out there still in the R&D phase and they will certainly have a lot to teach us in the years to come. I hope you are as excited as I am about the future of insects in feed production and look forward to hearing your thoughts on social media! In this post, I am going to show you how insect farming is not only revolutionizing the Western World, but also having huge impact on the lives of people in developing countries too. As many of you may have heard, Insect farming is a new trend that is sweeping the western world. It is rising from our needs for animal protein, an increasing need that cannot continue to be meet as the world population explodes. Insect farming involves raising insects for agricultural purposes and is an inexpensive solution for providing environmentally sustainable food for both humans and animals. In fact, we have covered this in the past, highlighting some of the best companies and products that are producing food for both humans and animals alike. Insect farming might be one of the best solutions, too, for helping developing countries become independent, or, at the very least, less dependent upon industrialized nations. Although no clear definition of developing or “third world country” exists, this type of country is generally thought of as being underdeveloped, non-industrialized, and extremely poor. These countries also exhibit the lowest indicators of socioeconomic development, have high population growth, and suffer from high mortality rates. The following map will help give you a clearer idea of the areas that are included, mostly Africa, Asia, South America and parts of Oceania. Entomophagy (the act of eating insects) has been practiced worldwide for a many years. 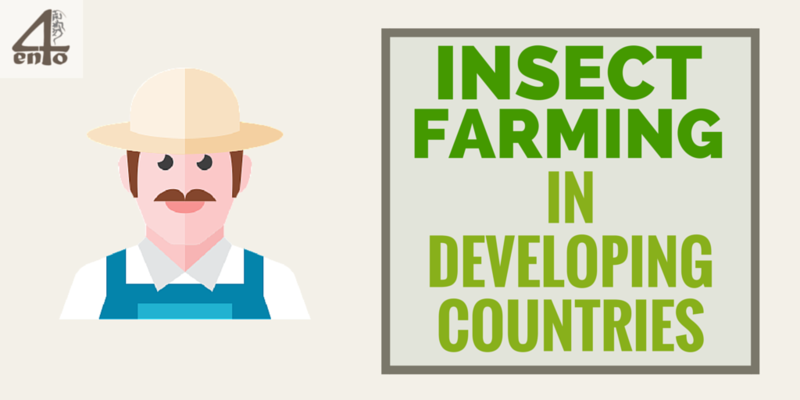 And in fact, most of these developing countries are already incorporating insects into their diets. At least two billion people in parts of Asia and Africa consume more than 1,900 species of edible insects, with beetles, caterpillars, bees, wasps, ants, grasshoppers, dragonflies, and crickets being the most common. Now bugs have found their way into the Western world, too. Crickets are being used in flour and baked goods such as protein bars and tortilla chips. The extract from cochineals is used in red food dyes. Restaurants in the United States and Canada are even making insects part of their menus. Bugs can be found practically everywhere, they reproduce quickly, and require only a fraction of the resources needed to sustain them. It is also far cheaper to raise insects than it is to rear cattle, pigs, or poultry, due to the amount of resources — such as land and water — used. When you compare the statistics for rearing cattle against those of rearing crickets, the savings are astonishing. 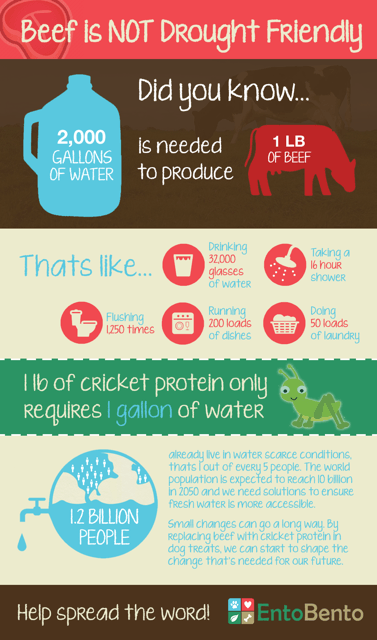 Crickets require a mind-blowing 2000 times less water than cattle to produce. Crickets don’t require as much land as cattle, either. The following infographic gives you a great overview of how many benefits crickets really have when compared to traditional cattle farming. Of course, there is also the fact that bugs also emit fewer greenhouse gases and less ammonia than livestock. But that is a story for another time. The main point I want to make here is that this is all great news for farmers in developing nations— they can raise these insects themselves, using less resources to produce the same amount of product. And in countries where resources are scarce, this is not only beneficial but perhaps a necessity as well. How much land is needed for an insect farm? How much water will be needed to sustain and grow insects? Is that amount of water already available? What guidelines need to be followed? Who is going to purchase the insects? What methods of delivery to consumers or retailers will be used? How quickly do the chosen insects reproduce? How many employees will be needed to run the business? Because there are still no specific education offered in how to start and manage a bug farm, and potential farmers are confused by the lack of regulations, beginning an insect farm poses quite a few challenges. However, despite the huge uncertainty there have already been quite a few success stories in some of these developing countries. Farmers in other countries are slowly learning that insect farming could be the answer to overcoming their poverty. #1. Thailand’s Aunt Jai set out to satisfy her daughter’s cricket cravings. Little did she know she’d be the talk of her village and end up tripling her initial investment within five months, going on to make more than that per month (! ), with plans to double her income in the future. Eventually, she plans on selling to wholesalers! #2. Boontham Puthachat lives in Thanon Nang Klarn, a village in Thailand. Boontham’s family has learned how to become self-sufficient by eating and selling crickets. Another exciting example is one being lead by the FAO. In 2013, they launched a 7-year program to train 1000 people in the city of Kinshasa, Africa in insect rearing and processing techniques to become insect farmers and further train others after project termination. They are currently in Year 2, and could be a success story to watch out for in the future. The Chapulín is already a well-established and accepted protein source in Mexico. Yet a combination of factors, such as lack of commercial production facilities, transparency over grasshopper handling, and a modest investment in modern agricultural technologies and techniques are hampering an increase in production to meet demand. The result: Chapulín is a more expensive protein source than beef. Working with the government and local associations, the Aspire Food Group is helping independent farmers in Mexico set up modern commercial production facilities to breed Chapulínes, creating a source of nutritious food and a potential year round income. Insect farming is certainly an option for both the First and Third World, but if people want to take this to a more sustainable and manageable scale, perhaps more innovation is needed. After all, not everyone wants to become a large scale farmer in order to provide enough protein for themselves or their family. That is where one man is trying to make a big difference. Jakub Dzamba, a Ph.D. student at McGill University has founded a company called Third Millennium Farming. He aims to produce an easy to transport and simple to use insect farm. In the short-term, Dzamba imagines that the contraptions could find a market in developing world countries that grapple with droughts, malnourishment, and poverty, and may already eat some insects in their diet. You can read more about his ideas and company in this article. However, it is certainly becoming clear that a combination of large and small scale farms could certainly help these developing countries thrive through the use and farming of insects. Another example of a company creating innovative, responsible business models and products to help farmers in developing countries comes from the company Khepri, in Europe. They have developed a cage with the warm and humid regions of Southeast Asia in mind. It is ecological, ergonomic, rot-proof and easy to move during the rainy season. The drawer system allows for easy separation of generations eliminating cannibalism between generations. Insect farming for food, as well as livestock feed, will become more and more sustainable over time, especially in developing countries. The above success stories show that it’s already a lucrative enterprise, and with more and more people learning about the many benefits insects provide, insect farming can be seen as an innovative solution for ending world protein shortages. What are your thoughts on the future of Insect farming and breeding? I’d love to hear from you. Can we really afford to keep producing food the way we do today, and still provide for generations to come? We need to start changing the way we approach food production, before the problems become too big to handle. It’s starting to become a question of global food security! But what are some of the issues that causing so many problems right now? Although this is not something that is on everyone’s radar, we actually waste an awful lot of food each year. If you take the time to have a look at what is thrown out at your local bakers each day, or investigate how much of our fruit and vegetable production is considered to be “unfit” for consumption (often due to size, shape or blemishes) it is actually quite astounding. Some motived people, such as Jeremy Seifert live off of this “waste” because it is in fact not really inedible. Such a stance on food waste clearly demonstrates how much we are needlessly throwing away each day. As much as 50% of all food produced in the world ends up as waste every year according to figures from the Institution of Mechanical Engineers. Now that is an incredible amount of waste, especially in a time where water shortages are causing us no end of problems. Is Water Shortage And Drought Really An Issue? One of the greatest issues we face as food production grows to meet the world’s expanding population is one of water availability. The developing world has faced this problem before, but in Western countries we often consider ourselves immune from such issues. However, recently some very developed areas of the world have suffered, or are suffering, from severe water shortages. The Australian Millenium Drought is considered to be the worst drought to have hit Australia since it was settled in 1788. And Australia is no stranger to drought, being an inherently quite dry continent. The drought officially ran from 1995 until 2009, and had quite an impact on a country that relies heavily on water for it’s own food production and exports. Although these solutions helped to address the problem, many of the hard questions on how we use our water to produce our crops were largely left untouched. So this means California is using unsustainable groundwater aquifers to make up their current shortfall, but in the long term there are bigger issues at stake. could mean cutting production of water-intensive crops, such as almonds and other tree nuts. Obviously, these are the easy wins, but we seriously need to look at how our water is used to get food to our table, not just which crop is the most water hungry from the outset. 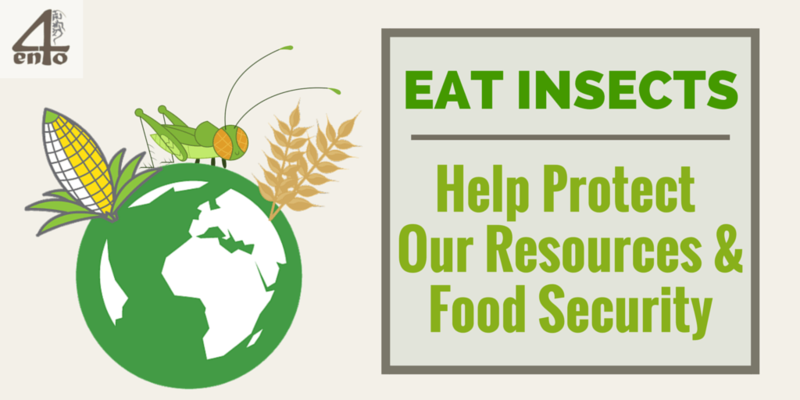 One of the greatest benefits of introducing insects into our diets is the amount of resources we can save. When you compare insects with one of our favorite protein sources, beef, the statistics are quite mind-blowing. Either way, crickets clearly come out on top. 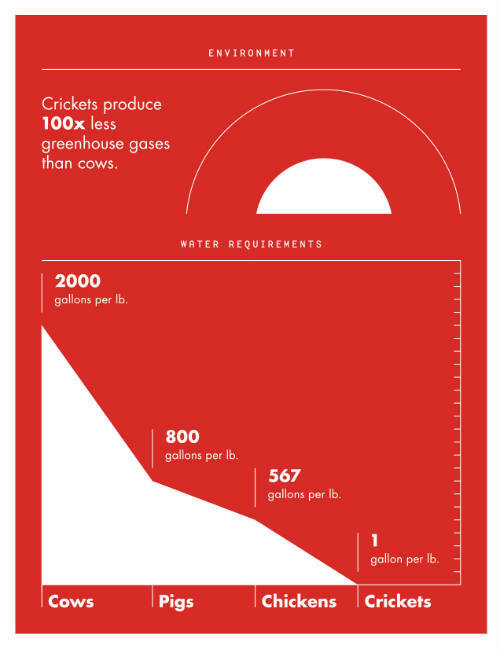 As you can also see, the emissions from crickets are also 100 times less than cows, which is a bonus we also cannot afford to ignore, especially given the current greenhouse gas problems that we face. Global warming anyone? What this actually means is that a lot of our food production capacity, water and other resources are wasted to inefficiently produce meat. Because we do not grow meat directly, but instead grow the crops, to feed the animals, to get the meat. The process is inherently wasteful. Insect production on the other hand, is actually very efficient. take six times less feed than cattle, four times less than sheep, and half as much as pigs. So again, the feed savings are huge. As are the land savings, which is another issue altogether. More facts: read more interesting insect vs meat facts here and a fun video on the topic below. We have mostly been talking about meat production and it’s associated resource waste, but what about the other end of the spectrum. Food waste itself. As I mentioned earlier, an estimated 50% of food is wasted each year. This is where insect-based protein production, predominantly for animal feed, is coming into it’s own. There are already a huge range of companies playing in this field of food waste to insect protein and fat production, to help supply feed for the fish, poultry, cattle and even pet industries. And if you want to get in on this trend yourself, you can buy kits to process your own food waste and turn it into feed for your own farm animals. As humans we often wait until things are almost too late to act and solve the problems that we face. In this case it is our planet and it’s inhabitants (us!) that are suffering as a result of our bad habits and inefficient food production practices. It is time to make a change, and insects are one of the clear ways out of this mess! Have you ever seriously thought about what goes into pet food? For many of us, we go about our daily lives and don’t really investigate how things are produced. And pet food is no exception. You can read even more disturbing dog food facts here. However, I think you start to see how your pets are not eating as well as you might think. And that is quite scary. Pet food in some cases also contains fishmeal which is known to be a great source of protein and healthy fats. However, how this fishmeal is actually produced, using fish harvested from our oceans, is really the main issue. Many of the developing countries we source our fish from are not under the same pressure to comply with legislation as we are. The result: wild fish are being over-farmed, which is causing havoc in various regions around the world (such as in Asia and South America). Not to mention some of the other by-products of the process and the human rights violations that often go with it. On the other hand, some companies aim to provide somewhat higher quality pet food. They promote or claim to be using “real” meat (or fish/chicken), which is great, but this then raises the question of world protein production as a whole. And we all know this is something that is causing us problems already. Should we then pay closer attention to the facts and figures surrounding worldwide pet populations? Of course, because their food has to be added to the overall food production costs that we as humans incur. 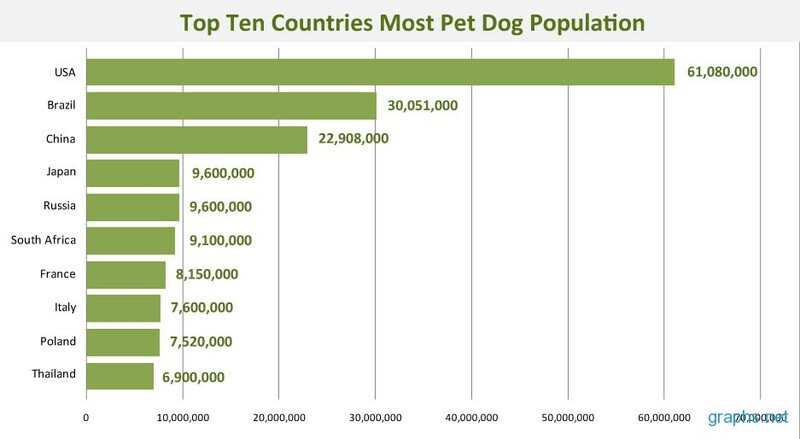 So how many pets are there in the world? 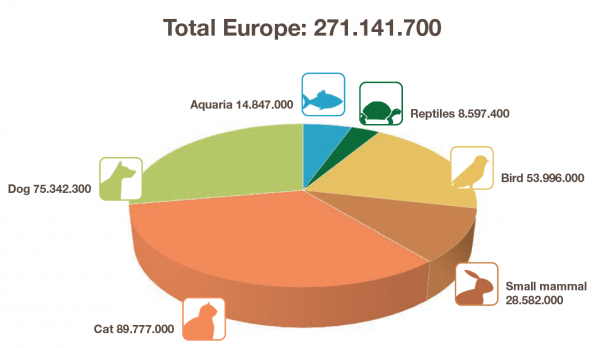 In the EU alone there are quite a staggering number, so we when you talk about food production numbers, we are talking serious amounts of protein for pet foods too. Please click here for the FEDIAF Facts & Figures 2012. If the rough figure of the world population of pet dogs is 300 million that is almost equal to the human population of USA. That’s a lot of dogs to feed! 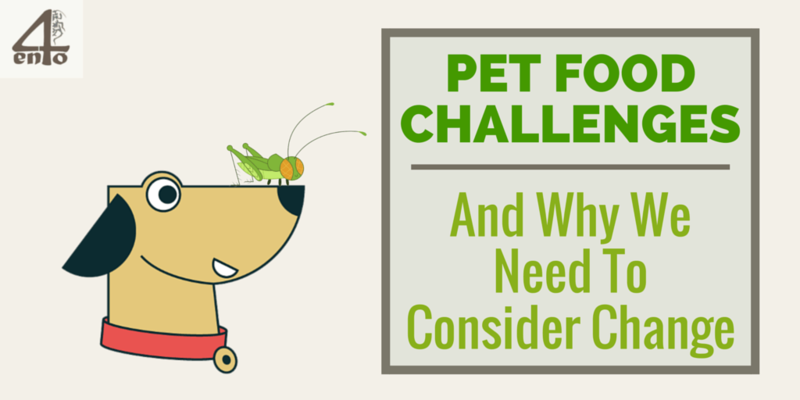 After learning all the above facts, starting to consider the addition of controlled and certified insect-based protein in your pet’s food would be a relief, rather than awkward, right? Insect Protein: Is it a Viable Alternative? Perhaps insects are far more acceptable food for our pets? I know I personally would not mind feeding them to my pets. After all, insects have long been a part of animal diets and pets can often be seen hunting and then eating insects when they are outdoors. Insects and their larvae are very high in protein, offering a complete amino acid in many cases (especially crickets), which is not the case for all protein alternatives like soy. And on top of this, they are also high in omega fats, which can also have great benefits for your pet. You also need to consider the resource savings that can be had when using insects instead of fish or meat too. And the benefit list goes on and on. Insect-based feed is not only sustainable, but it is also helps with reusing wasted or discarded food (we have covered this in detail in my last post). I also invite you to read this article written by Dr Ken Tudor for Petfood 2.0 where you can learn about the efficiency, sustainability and regulatory costs of insect production. It is time we started considering the alternatives, right? 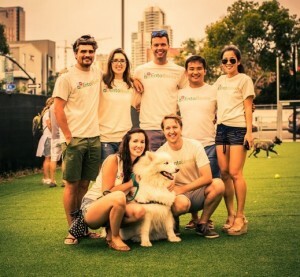 Would Insects in Pet Food Make Sense as a Business? You might be surprised to learn that many companies out there are already producing feed products that include insects. The following companies are mostly using black soldier flies to produce protein and fat from their larvae, which is a great source of nutrients for animals. Enviroflight are selling insect-based meal to zoos and pet food producers. And Glen Courtright, their President, is confident their processes will work anywhere in the world now, as he stated in an interview on Inc in October 2014. Another entrepreneur Jason Drew, this time in South Africa, estimates that there is a market for some 2,500 fly farming factories around the world of the size his company has. And I am also happy to inform you of the official launch of the IPIFF a non-profit organization that gathers the main EU private players in the insect industry together. 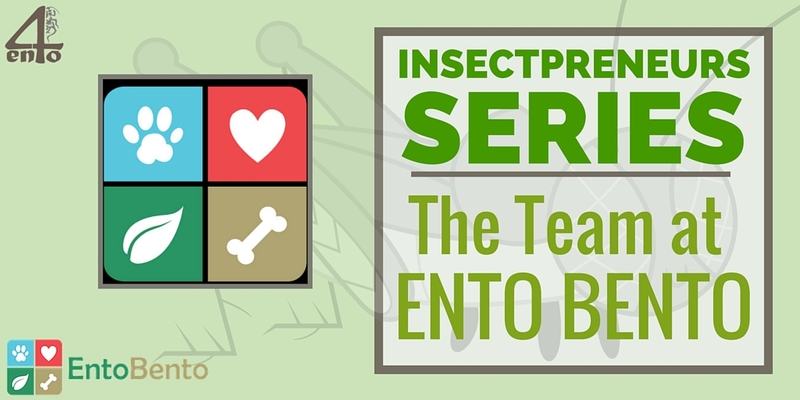 Then there are companies producing insect based pet products like EntoBento in the USA, who are using mealworm to create some tasty dog treats or Jonker Petfood who are offering a new pet food containing insect protein. Last, but certainly not least, there is DeliBugs, who will be launching their premium adult dog food (Bugs for Pets) in August 2015. As you can see, things are just starting to happen in this industry, but the implications are huge. You Should Sit Back And Do Nothing, Right? So far, we have covered what it is being currently use in pet food, and why it is a concern. We know how unsustainable fishmeal will become. We have discovered the mind blowing figures of how many mouths are being fed each and every day, including our pets. Am I going to ignore all of this and continue on as if nothing is happening? But perhaps the simplest thing you can do is to start supporting companies producing these products or buy sustainable insect-based pet food. The choice is in your hands! Today we are going to learn about the Insectpreneur story behind Co-Prot. Co-Pro was founded by Gil Berholz, who was educated in both agricultural science and agribusiness, and has extensive experience in agri-trade and export industry. In order to supply the growing insect-based animal protein feed business, Co-Prot was established with a focus on South East Asian markets. 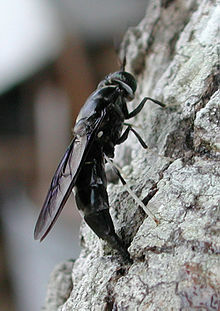 What sparked your interest in Black Soldier Fly? The lack of sustainable protein solution for animal feed was the trigger. The Black Soldier Fly (also known as BSF) was very attractive because of its ability to process organic waste and grow on wide variety of feed materials. Note: Find out more about other businesses using BSF in this article. What prompted you to look further into rearing Black Soldier Fly? And why Cambodia? At first glance rearing BSF seemed to make a decent business model. Cambodia has space, tropical weather and simplicity of opening such ventures. Cost wise it is also very attractive. Its potential location is good: between huge protein markets: Thailand, Vietnam, China Taiwan etc. What Were the First Steps You Took To Start The Business? Developing a rearing protocol and building a rearing farm. What Early Lessons Did You Learn? Well, this lesson was not early, but after investigating with an investor we saw that BSF rearing is not really scalable, and risks are higher than potential returns. So we had to pull the plug from this initiative. First, to produce 1 ton of dry insect meal, one will need about 15-20 tons of fresh (wet) organic waste of high quality. So to produce a 40 foot container of insect meal, one will need 400 tons of fresh waste. That requires a huge logistical operation of waste collection sorting and transport. This practically means that primary operation of such a company is waste management, and secondary activity is protein production. Secondly feed safety is a big concern. It is still unknown if antibiotics, pathogens, heavy metals, microtoxins etc. are passing through from the rearing substrate to the end product. That means that many cheap and available substrates, such as pig manure and uncontrolled waste have to be excluded. This has a large impact on scaling the operation. are not yet explored and managed. Issues like these could wipe out the whole operation in matter of few days. For these reasons the EU legislation is not moving forward very quickly to allow insects in the feed chain. However these reasons/risks are also valid for the whole world. At the current possible selling price for insect meal of 950$-1350$/ ton, a production of minimum 3000 ton per year starts to be interesting. To get hold of enough safe, high quality larva feed to produce this large quantity is a challenge and a large business risk. Let alone that acquiring business license, quality and safety certifications to grow and produce insect meal. This can be a lengthy, expensive process that can take more than 2 years. Put all of these together and you have a very risky business! Finding clients was actually not a problem. We were contacted by more than 25 companies, among them some multinationals that wanted to experiment with Insect meal. The market really wants to see this product coming and is looking forward to it. What Are Your Current Aims for Co-Prot and the Insect Industry? Co-Prot is currently not active. If some company will crack the scalability and safety issues and will produce large quantities on insect meal, Co-Prot will be happy to be the marketing agent for their produce in Asia, as we have very interesting contacts there that are willing to buy insect proteins. I believe that the insect industry for animal feed will stay a negligible niche until these issues are solved. In order that large feed companies will invest in producing formulas containing insect proteins there will have to be at least 100,000 tons produced every year with at least 3 large producers. Only then the mainstream feed industry will step in. Currently we are very far from this point. What is your advice for entrepreneurs considering entering the industry? Prepare well for the challenges. It is not simple and it is not a goldmine as one may think ! Interested in more Inspiring Insectpreneurs? This is an ongoing series of interviews with driven and successful entrepreneurs in the Insects for Food/Feed business. If you know of an inspiring Insectpreneur who you think should be showcased in this series (even if it is you! ), be sure to get in touch with me. Today you are in for a treat, but not your standard kind. We are interviewing the Ento Bento team about dog treats! Most of our interviewees in this series are either creating products for human consumption or industry. So this will make for an interesting take on the insects as food challenge! What Sparked Your Interest in Dog Treats? We started out as complete strangers in a Startup Competition with the idea to create automated insect grow kits. When we did our market research, we found consumers were not quite ready to harvest insects in their home, restaurant, or garden. We talked to random people at the farmer’s market and asked questions about what insect products they would consider using. The most popular answer was that they were comfortable feeding insects to their dogs because their dogs ate them already. We discussed the findings amongst our team and found we all love dogs! We kept the idea going with a mission to promote insect protein starting with man’s best friend! What Prompted You to Look Further Into Cricket Powder As Source of Protein for the Dog Treats? First we were looking at harvesting mealworms as our protein source. Then we realized, with our San Diego, California city living situation, we didn’t have the resources to produce insects at scale. We looked out for other insect protein in the market and found Aaron Dossey at All Things Bugs who was really cool and sent us a one pound (about .45kg) sample to get started!! There was more cricket powder out there and suppliers ramping up, so we knew crickets were our best starting point. What Are the First Steps You Are Taking to Start This New Activity? Our first steps have been researching as much as we could about the pet industry and dog nutrition. We knew we had to set ourselves apart with a healthy and sustainable treat. We worked with industry experts to create an awesome and delicious treat! We know we have to adapt to insect protein in the future. We think the path to change can be through joy and wagging tails! We learned dogs are picky! They are used to processed, low quality meat based treats so we had difficulty at first with our healthy treats. We learned a ton from local chefs on how to get the right flavors and texture. We have a lot of happy sample testers, and we will have our first client really soon! Our Kickstarter is launching 11/3/2015 so anyone within the US and Europe can pre-order our treats. What Are Your Current Aims in the Pet Food Industry? Our goal is to create a healthy, high protein treat that dogs love, and owners appreciate for its eco-friendly properties. What do you see as the main challenges for mainstream adaptation of insect-based for dog food/treats ? I think our biggest challenge is education. Some people have an instinct to reject cricket protein. Our goal is to overcome that with expert analysis, bioavailability trials and constant comparison between the superior nutrition and sustainability aspects of insects versus traditional meat protein. What Is Your Advice for Other Students Considering Entering the Insect-based Industry? It is a young industry and it almost seems like everyone is on the same team. I hope we see some phenomenal ideas and social business ventures in the industry. Share a few recommendations for readers who are interested in exploring products containing cricket powder for their pet/dog product or diet! Our inspiration is the United Nations Food and Agriculture Organization (FAO). Especially their paper in 2013. Cricket powder is just breaking into the pet industry as an alternative protein source. I think we will see a lot of advancement soon with treats and even food – we are really excited to be a part of it!! If you like the idea too, please share our message! 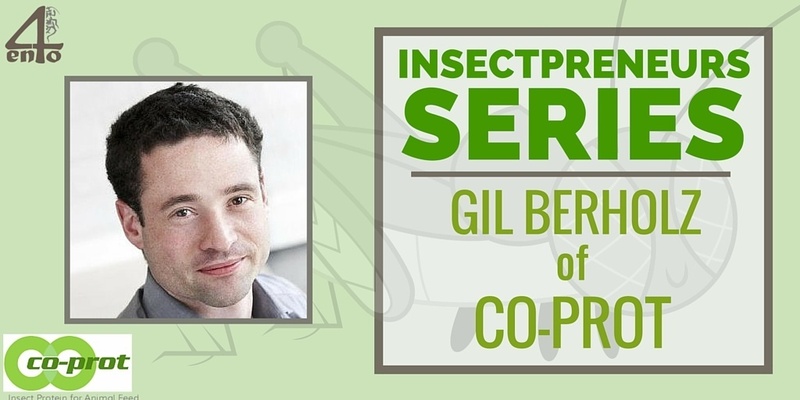 Want To Meet More Insectpreneurs? Here at 4Ento we are interviewing some of the up and coming stars, as well as industry leaders in our Insectpreneur Series. So go check those out if you want more inspiration and insect eating goodness! And don’t forget to check out Ento Bento’s Kickstarter campaign.